COULD IT BE RESTLESS LEGS SYNDROME? Also called Ekbon syndrome, hereditary acromelalgia, anxietas tibialis, or leg jitters, RLS is a fairly common problem. It affects 20 percent of all pregnant women and 15 percent of all Americans over the age of 50. RLS frequently puts in a brief appearance during menopause, so the figures may be higher among menopausal women, but is most likely to bother women after menopause. RLS is both a movement and a sleep disorder, and tends to run in families. Modern medicine has little understanding of RLS, and few ways to ease it. (It may be related to kidney function; half of all those with kidney failure have RLS as a consequence.) The Woman Ways gathered here have been passed from grandmother to granddaughter for generations, offering relief and aiding sleep. They are listed in order of increasing harm. The first remedy is the safest; the last one is the most dangerous. This article is a condensed version of the restless legs syndrome chapter in New Menopausal Years the Wise Woman Way; Alternative Approaches for Women 30-90. ~ Simply observe the feelings and movements in your legs. Remain the observer. No need to change anything. Nothing to do. Mind serene. Emotions at peace. ~ The movement of chi (life force energy) through the body is variously described as the flowing of water, the flaring of a fire, the pushing of the wind, the pulling of the earth. These are also descriptions of the sensations of RLS. Energy flow notably (and sometimes uncomfortably) increases in the body after menopause; it is possible that what you are experiencing is "merely" that (and chi, according to Traditional Chinese Medicine, is stored in the kidneys). Channel the energy up out of your legs and into creative or healing endeavors. ~ Ann Landers says putting a bar of soap in bed with you will calm those crampy, restless legs down fast. She offers no scientific explanation, but claims it is harmless if it doesn't work, and effective if it does. ~ Muscles that lack minerals - especially calcium and magnesium - go into spasms and quiver. If this sounds like your legs, reach for a big glass of nourishing oatstraw infusion. Make it by placing one ounce by weight (a cup by volume) of dried oatstraw into a quart jar, which is then filled to the top with boiling water and tightly lidded. Brew for four or more hours, then strain and refrigerate for no more than two days. Drink hot or cold, sweetened or not. I regularly drink mellow oatstraw, 2-4 cups a day, several times a week. ~ Work those legs, and they're more likely to stay quiet at night. So exercise it is. If you are stuck behind a desk, run in place sitting in your chair for several minutes every hour and take a walk during your lunch break. ~ Low blood levels of iron, with or without anemia, are strongly linked to onset and worsening of RLS. Boost iron by consuming lots of molasses or by drinking nourishing nettle infusion. (Prepare the same as oatstraw infusion, using a full ounce of dried nettle to a quart of boiling water and steeping for at least four hours.) If you have RLS due to end-stage kidney failure, nettle is an exceptional ally for you. I was told by a student that she avoided a kidney transplant by drinking nettle infusion daily. Nettle not only builds iron but it strengthens the kidneys, too. ~ RLS is also associated with folic acid anemia and a B vitamin deficiency. Red clover infusion is rich in both, as are oatstraw and nettle. ~ Losing sleep because of RLS~ A dropperful/1 ml of St. Joan's wort (Hypericum) tincture, taken 5-10 minutes before lying down, can help prevent spasms all night. Sleep-inducing herbs, such as valerian, may worsen the problem, but a cup of chamomile tea or a mug of warm milk will encourage sound sleep without side-effects. ~ A warm bath before bed can keep your limbs quiet all night. Massage definitely helps too. ~ When RLS wakes you in the night: Stretchhhhhhhh those muscles by pointing your toes away from you and imagining that someone is pulling on your leg. ~ Eliminate coffee and alcohol for a month. Sometimes this effects a complete "cure." ~ Alternate hot and cold packs on your legs for a half-hour before bedtime. ~ The grandmothers' favorite remedy for cranky legs is a sip of tonic water before bed. Its quinine content is no doubt responsible, but the refined sugar you also get is not healthy, so use this remedy is moderation. ~ Some drugs may trigger the onset or worsen already existing RLS. They include: calcium channel blockers, anti-nausea drugs, tricyclic antidepressants, serotonin re-uptake inhibitors (SSRIs), lithium, some cold and allergy medications, and the anticonvulsant drug phenytoin. ~ Drugs used to control (there is no known cure) RLS include: Dopaminergic agents (such as levodopa), which can worsen symptoms over the long run. Dopamine agonists, whose long-term effects remain unknown. Opiates, which are addictive, but incredibly effective. And, when all else fails, anticonvulsants and benzodiazepines. Needless to say, there are severe side-effects and little guarantee of improvement with these drugs. Whether you have a diagnosis or simply suspect you have Restless Legs Syndrome, Wise Woman Ways offer simple, safe, accessible remedies to ease your legs and build your health/wholeness/holiness. Author: Susun S. Weed. Simple, safe remedies for pregnancy, childbirth, lactation, and newborns. 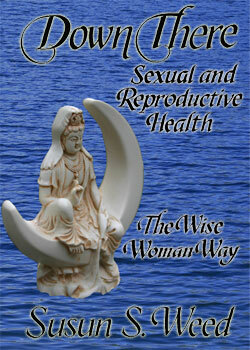 Includes herbs for fertility and birth control. Foreword by Jeannine Parvati Baker. 196 pages, index, illustrations. Susun Weed, green witch and wise woman, is an extraordinary teacher with a joyous spirit, a powerful presence, and an encyclopedic knowledge of herbs and health. She is the voice of the Wise Woman Way, where common weeds, simple ceremony, and compassionate listening support and nourish health/wholeness/holiness. 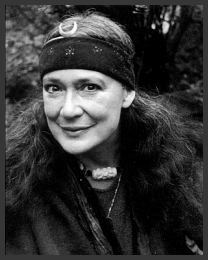 She has opened hearts to the magic and medicine of the green nations for three decades. Ms. Weed's five herbal medicine books focus on women's health topics including: menopause, childbearing, and breast health. 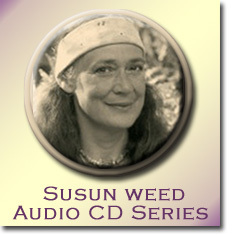 Visit her site www.susunweed.com for information on her workshops, apprenticeships, correspondence courses and more! Venture into the Menopause site www.menopause-metamorphosis.com to learn all about the Menopausal Years the Wise Woman Way. Join Susuns Mentorship site for personal one on one mentorship! 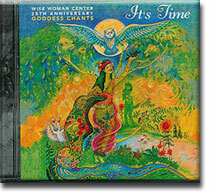 We also invite you to visit our commerce site www.wisewomanbookshop.com to learn about our Wise Woman publications, workshops, correspondence courses. As well as courses at teachable.com and Wise Woman University.